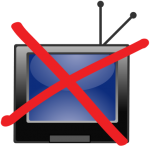 No TV for 90 days! Last week my husband and I took a short break during our vacation to attend a 2-day conference called First Steps to Success by Dani Johnson. This was one of the first conference/workshops that we attended where the content was geared towards entrepreneurs and employees alike. There are times when my husband doesn’t “get me” and it’s rare for him to attend a conference with me because it’s just not relevant to his way of life, but this was different. The content was great, and Dani gave us some great insight and resources for overall personal and business relationships in our life. One of the challenges we were given by this rags-to-riches millionaire was to fast from television for 90 days! Yes, no tv for 90 days! The goal of this serious challenge was to see how much our in-person relationships improved as well as our view of the world and our place in it. The concept is not foreign to Darren and I. At times when we’ve felt our relationship lacking we’ve instated “Media free Mondays” where we’d come home and not watch any tv, not hop on the computer, and just play games or chat. It’s always been wonderful. Well, it’s been a week and I’ve had no tv. Not even a video popped into the dvd player (although I think that’s allowed as long as it’s not trash or crap). It hasn’t been hard for me, since every tv I’ve ever had has been given to me by some dude in my life anyway. Darren’s watched about 10 minutes, not too bad, I suppose. What I’ve discovered in this quest is that my mind is SO MUCH CLEARER in everything that I do. It’s amazing how over-stimulated and full we get from watching even just a little bit of television. There’s definitely a lot of subconscious energy involved in it. This has me thinking… of course… how much unconscious junk is really in our everyday environment? I’m having a great time with it. We’ll see how I feel in another week, or month, or year, but in the interim, this girl’s on fire. How about you? Have you ever done a media cleanse? Ever thought about it? What were the results?